Article: Nickelodeon Announces The Highly-Anticipated Premiere Date For “Legends Of The Hidden Temple” Premiering 11/26! We all have been at the edge of our seats waiting for the highly-anticipated premiere of Nickelodeon’s outstanding movie, Legends of the Hidden Temple, based on the iconic 90’s game show. Now that it is officially the fall season, we’ve been super excited to find out when the spectacular movie will be making its way to our TV screens and it looks like our lucky day is here! Nickelodeon has just recently announced that we all will be able to join in on all of the adventures as Legends of the Hidden Temple will be premiering on Saturday, November 26, 2016 at 8:00 PM ET / PT. We all are marking down our calendars and starting our countdowns to the remarkable movie premiere. Legends of the Hidden Temple stars many familiar faces including Nickelodeon veteran and Transformers 5 star Isabela Moner, as well as Jet Jurgensmeyer, Colin Critchley, original TV host, Kirk Fogg and the original voice of Olmec, Dee Bradley Baker. The 90 minute movie will have viewers ready to embark on an exciting adventure of their own as they see these three siblings take on some tough obstacles to escape from The Hidden Temple alive. Fans can stay connected with all things Legends of the Hidden Temple by heading on over to nick.com/temple for exclusive sneak peeks, behind-the-scenes fun, and excellent photo galleries. Prior to the premiere, a special game will be released on the site where people can take on the character of Sadie, Dudley, or Noah and enter in The Hidden Temple to find the two pieces of the Pendant of Life. 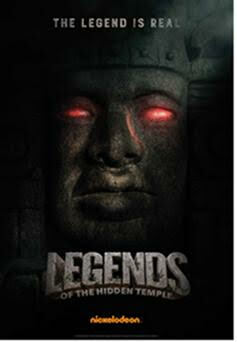 We are all so thrilled to find out that the premiere of Legends of the Hidden Temple is coming super soon! This movie will definitely be another one of Nickelodeon’s endless list of masterpieces and we can’t wait to watch this movie and infinite amount of times. Be sure to gather your friends and have a fantastic viewing party for the premiere of Legends of the Hidden Temple on November 26, 2016 at 8:00 PM ET / PT on Nickelodeon and check out the official trailer for the movie below. Previous Article: Rio Mangini And Mark Mangini Had A Phenomenal Time At “The Accountant” Premiere! Next Article: Tune In To A Heart-warming Episode Of Nickelodeon’s “The HALO Effect” Titled “My Brother’s Keeper NOLA” 10/14!